The Victorian who is said to be the most powerful person in the world. 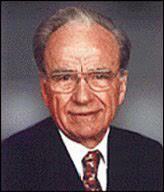 Media mogul Rupert Murdoch was born in Melbourne, Australia, on the 11th of March, 1931. Today he is better known as the owner of News Corporation Ltd., a media conglomerate that has ventured into all forms of media: television, film, print, and most recently, the Internet. 20th Century Fox, The Fox Network, HarperCollins, and The New York Post are only 4 of the many forms of media that the News Corporation Ltd. owns. Before becoming the tycoon he is today, Murdoch studied at Oxford and worked at the Daily Express for 2 years. He returned to Australia in 1952, when he inherited The Adelaide News (his first paper) from his father Sir Keith Murdoch, a Melbourne publisher. He, in turn, transformed a rather small newspaper from a small town into a major success and even a threat to the competition, so that he could earn the money to leave Adelaide. His work with The Adelaide News was only the beginning of what was to become a media empire. In the 60's, he did the same with the Mirror in Sydney as well as the News of the World and The Sun in London. In the 70's he turned The New York Post from a serious, stagnant paper into the provocative paper it is today. Murdoch acquired The Times and The Sunday Times in London in the 1980's and he took on Hollywood by purchasing 20th Century Fox and Fox TV that same year. Asia was the next spot for Murdoch, where he purchased Star Television in the 90's. Although most of Murdoch's acquisitions have been successful, not everything was so peachy in the land of Murdoch's media empire. Star, which he acquired in 1993, has a huge potential market with an audience ranging from Japan to the Middle East via satellite. The problem was that Star only had a local audience and while the Indian market had satellite dishes, the Japanese market did not, therefore Star had difficulty growing. His political stance being anti-communist and anti-soviet, he thought that offering the Chinese market satellite broadcasting would seem like a viable way to go against the control of information that it undergoes. Another potential problem faced by Murdoch was the fact that his empire was at the risk of crumbling because of Murdoch's huge expenses during the recession of the early 90's. Luckily, because most bankers trusted Murdoch, they agreed to erase his debts incurred from the amount of loans he had taken all over the world. Chairman and CEO of a Corporation whose net worth is $5.3 billion, Murdoch has bounced back from whatever downfalls he has experienced in the past. Today the News Corporation now includes: a lion's share of the newspaper industry in Australia and approximately one-third of British newspapers and BSkyB (satellite television in Britain), not to mention businesses in most media industries on three continents. In addition to holdings in the media, Murdoch owns the LA Dodgers, the National Rugby League, Broadsysterm, and Fox Interactive. He has successfully ventured into the Internet market as well, with his LineOne Service, among others. Murdoch has received a lot of criticism -- more than any other media tycoon. An American citizen since 1985, he is seen as having a right-wing political stance. It is also widely believed that he has lowered the quality of everything he has ever worked on. Although he has saved many publications, Murdoch believes that the main reason he receives so much criticism is because he embraces change and describes himself as a "catalyst for change". One wonders how Murdoch could have found the time for love and relationships between his major holdings in the media. In 1967, he married Anna Troy, whom he met while she was a trainee reporter on the Sydney Daily Mirror. After being married for 31 years, the couple got divorced in 1998. Presently married to Wendy Deng, who formerly worked for Star TV in Hong Kong, Murdoch resides in SoHo, Manhattan.